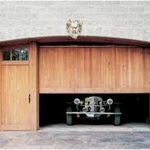 What are the most common types of garage doors? The canopy retractable garage doors are considered one ofthe best doors as you can get it in different materials like timber, GRP, steeland ABS. These doors are considered as the best option as they are easy to use. They are easy to automate and have moderate security features. However, they are not draft-proof and needs a meter of clearance in the front side of the garage. So if you have an ample frontal space, you can install this type of garage door. Most of the apartments choose roller garage doors because they provide excellent security features where the door closure is held in Channel down from each side. Moreover, it is ideal for the houses where there’s no extra frontal space, since it rolls up and needs no space. Side hinge garage doors are bolt-fitted doors and have converter bars. These side hinge garage doors are made of timber, thus making the doors lightweight and ideal for day-to-day use. The door needs a frontal space and it opens outwards. Wooden vs. steelgarage doors: which one is the best? wood material contract and expands with the weather change. If exposed to harsh weather, it might get easily damaged. A regular maintenance can keep it in a good shape. The steel garage doors are more durable than the wooden doors, and the best part is that they do not expand, contract or crack up with the extreme weather conditions. They also do not need regular maintenance like the wooden garage doors. However, the only disadvantage is that they are not lightweight. The fiberglass or GR garage doors look gorgeous when installed, and are ideal for the places near sea and ocean, with salty weather.These fiberglass garage doors require no maintenance and a gentle cleaning can make the garage doors look nice forever. best suited garage doors for your apartment. Make sure not to compromise on the look and feel of the garage doors, as these garage doors add up to the beauty of your apartment. Get the best of garage doors and stay safe! This entry was posted in Home Improvement and tagged Garage Door. Bookmark the permalink.